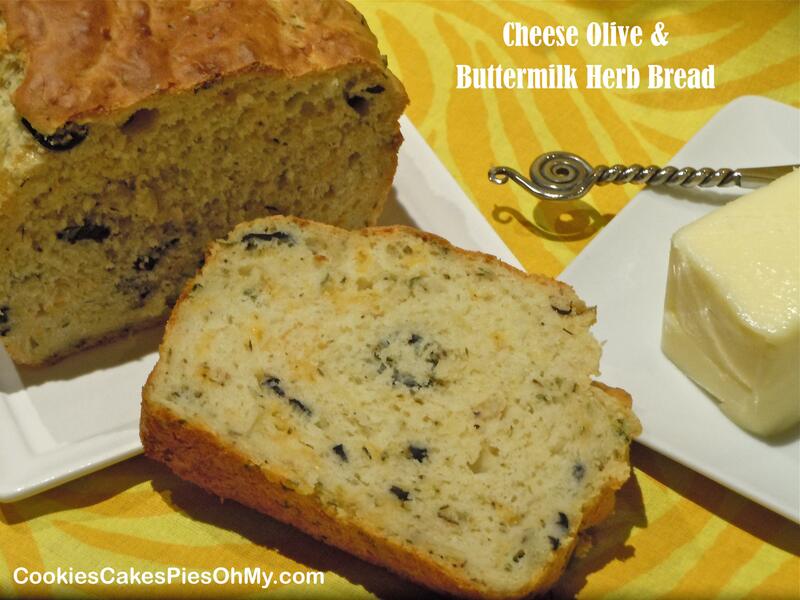 The look of this bread was interesting to me, plus the herbs looked wonderful. 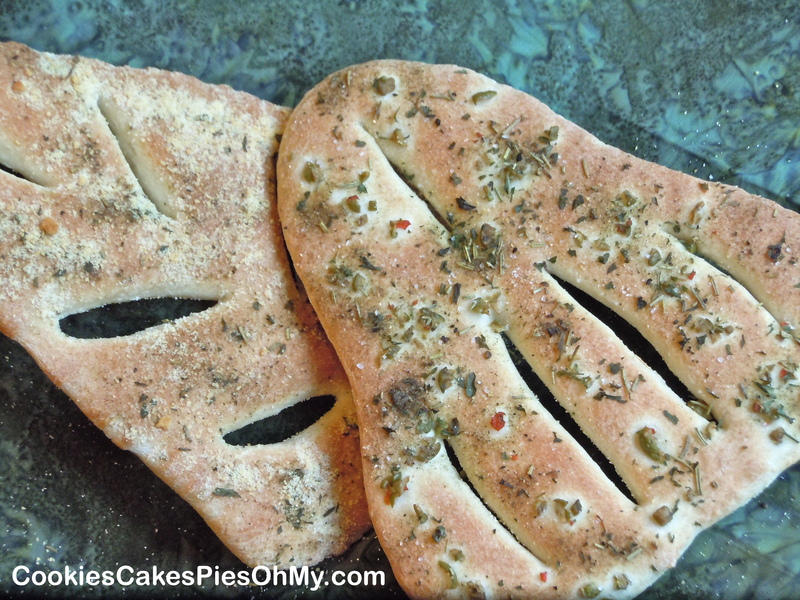 Reading about Fougasse, I found out it is a type of bread typically associated with Provence but found (with variations) in other regions. Some versions are sculpted or slashed into a pattern resembling an ear of wheat or a leaf. 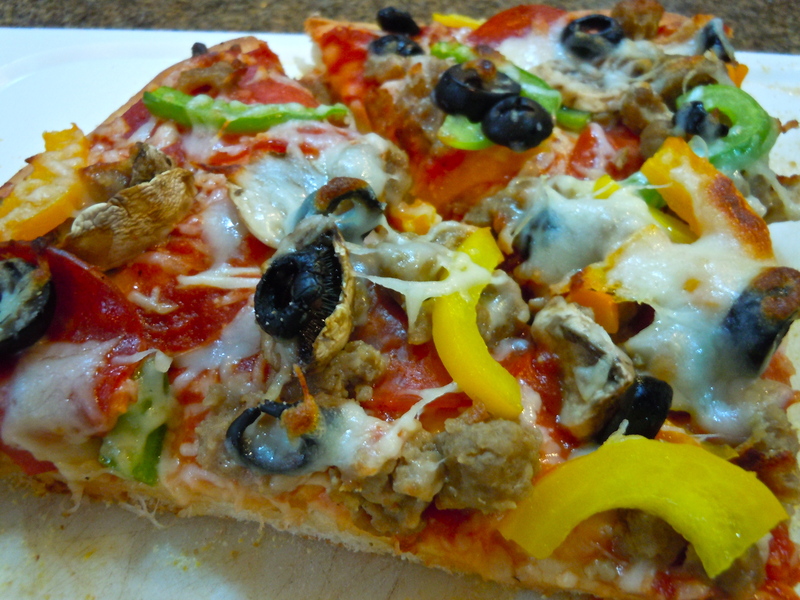 It is a simple and versatile flat bread…pronounced “foogass“. 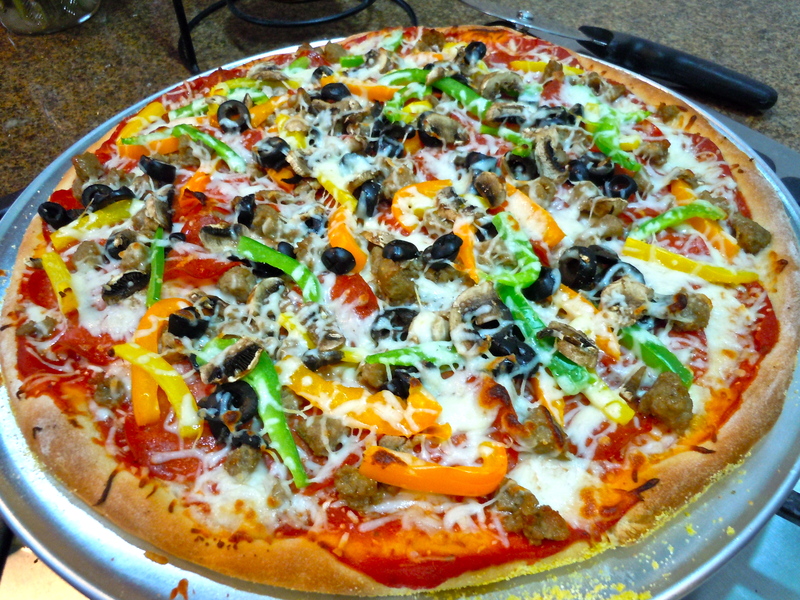 You can add different herbs, olives, and cheese to create your own taste. Pull apart and enjoy. In a large bowl of mixer, add warm water and sprinkle yeast and sugar; let sit until foamy, 10 minutes. 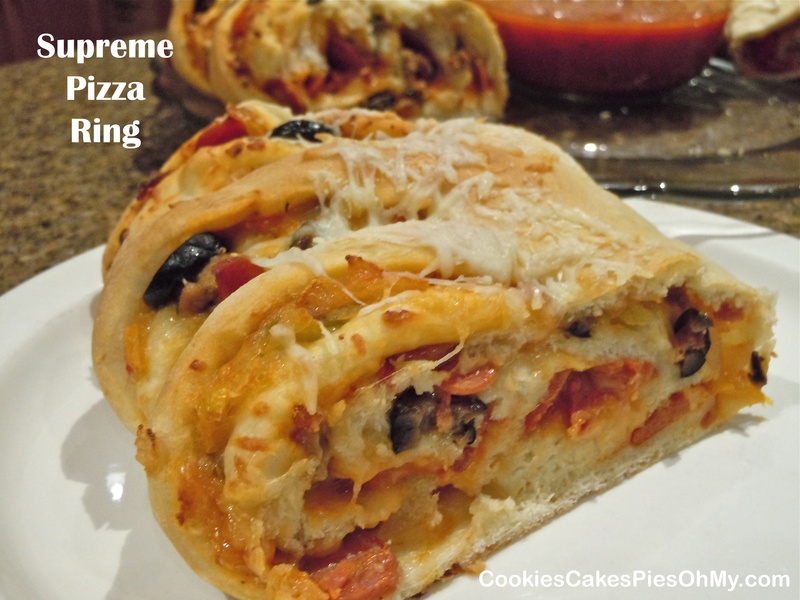 Stir in oil, flour, and salt and mix until a dough forms. Knead. Cover with damp towel, let sit until doubled in size about 1½ hours. 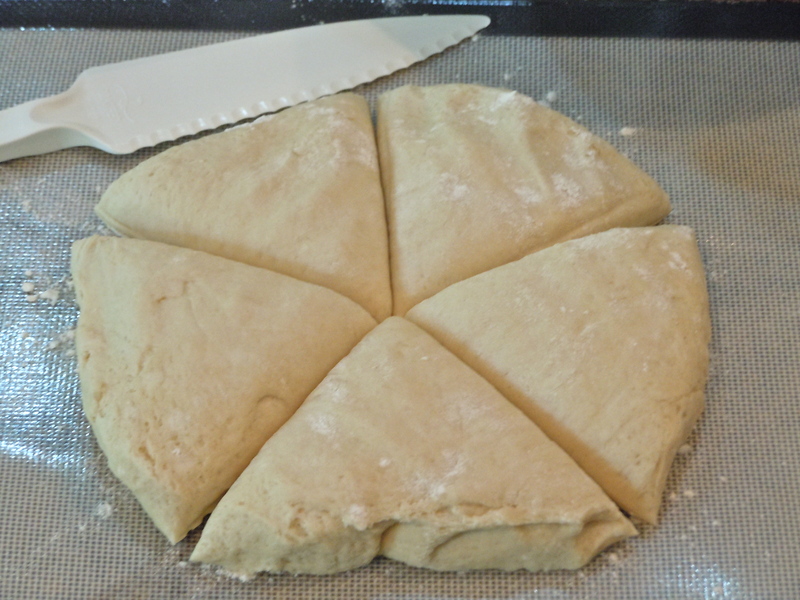 Divide dough into 5 equal pieces. Working with one piece at a time, roll into a rough 8″ x 5″ triangle. Transfer rectangle to a cornmeal-dusted Silpat or parchment lined baking sheet. 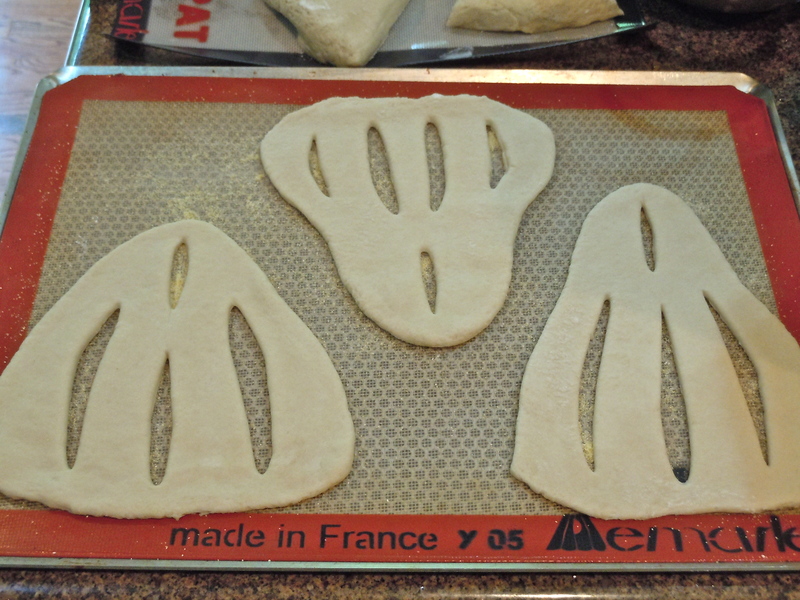 Cut slashes in middle of dough to make desired design (traditionally was made to look like wheat stalk or leaf). Spread slashes apart a bit with your fingers. Cover with a damp towel, let rest until puffed, about 30 minutes. Heat oven to 450°. Combine olives and herbs in bowl. 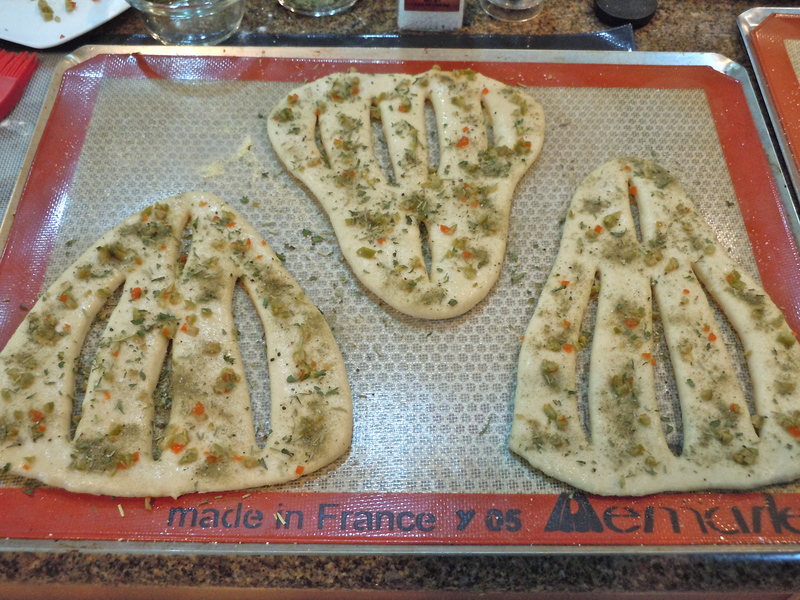 Lightly brush each dough piece with olive oil, sprinkle with olive mixture, and season with salt & pepper. Bake, until golden brown, watch closely 8-15 minutes, time depends on thickness. This is our new favorite sandwich. The olive spread has intense flavor and all the meat and cheese, it is an incredible bite! Plus, the presentation is an impressive stack of goodness. 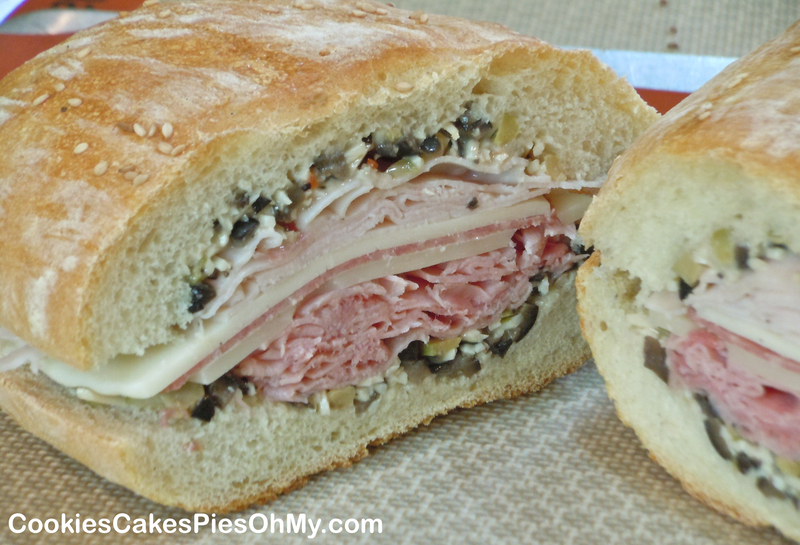 It can easily be made on a purchased Italian loaf, but if you have the time there is nothing like homemade bread. From tasteofhome.com. In bowl of mixer, pour warm water, sprinkle yeast over water, and sprinkle sugar over yeast. Add olive oil, flour, and salt, mix and knead. 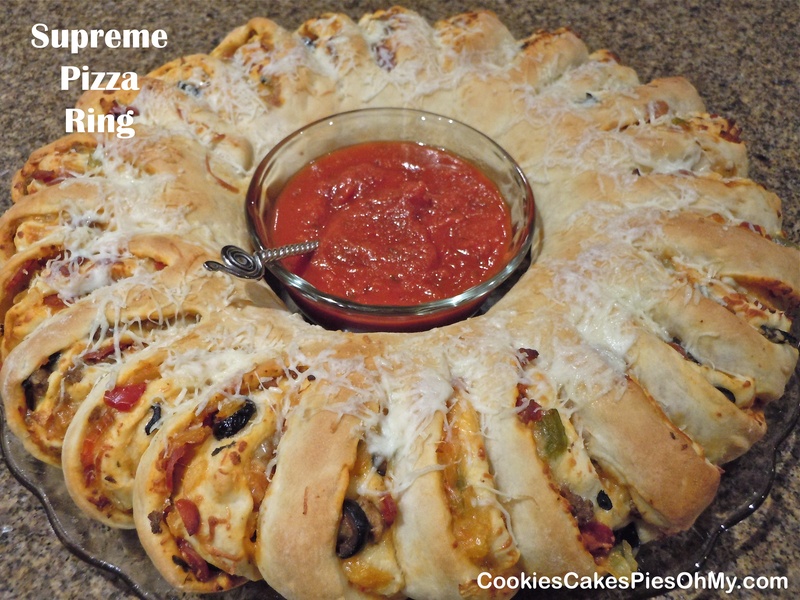 Turn dough out into greased bowl, turn over to coat, cover and let rise 1 hour. Punch down. Form into loaf, round or oval, your choice. Put on Silpat on perforated sheet or lightly sprayed baking sheet. Cover and let rise about 30 minutes. Preheat oven to 425°. Brush loaf with egg white and sprinkle with sesame seeds. 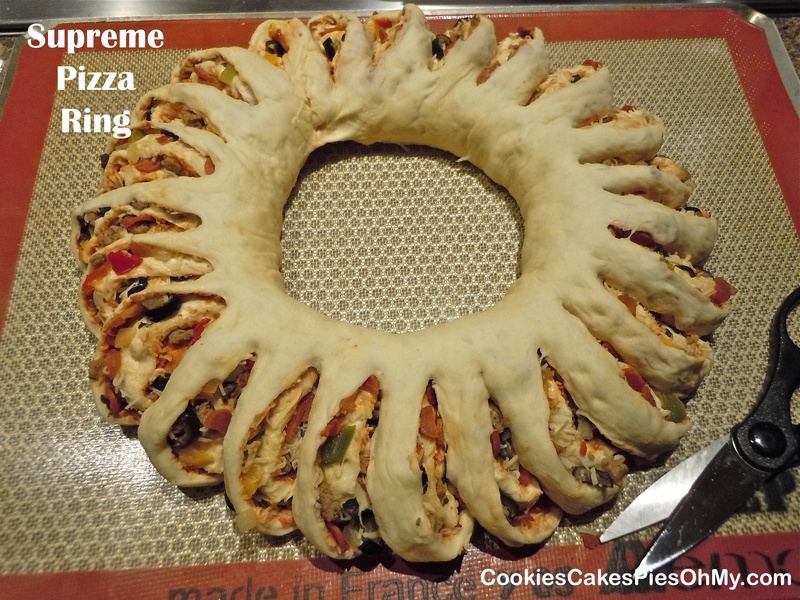 Bake for 35 minutes, cover with foil during baking to stop over-browning. Cool completely. In a small bowl, combine green olives, black olives, Parmesan, dressing, and garlic, set aside. Cut bread in half horizontally and carefully hollow out some of top and bottom of insides for filling. Spread half of olive mixture over bottom half of bread. Layer with turkey, Swiss cheese, salami, provolone cheese, ham. 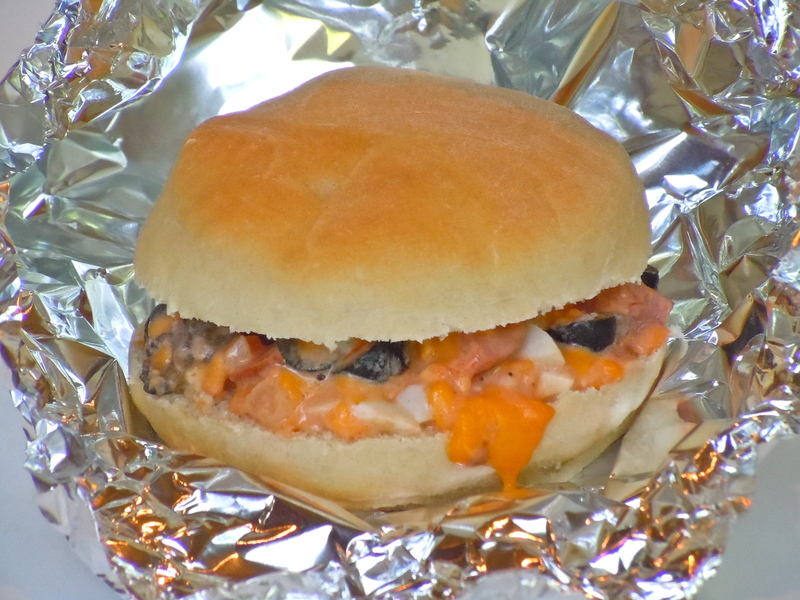 Spread remaining olive mixture on underside of bread top and place on sandwich. Cut into individual portions to serve.